Sherie Bishop Harkins’ fine art has been described as "an indulgence for the senses”. Harkins is paying attention to the means through which we acquire and interpret information. This concept is expressed through her experiences and masterfully depicted on her canvas. Harkins is intrigued with the contrast between how we perceive, and what can be revealed with insightful rendering. Born into a wandering family, Harkins settled in Bucks County Pennsylvania as a teenager. While Art making was a consistent solace in the process of making new friends and finding her place, the changes in her location and experience have given her a unique perspective from which to observe and share. After earning her BFA in Painting from the Visual and Performing Arts College at UMass Dartmouth she extended her creative options as a Landscape Designer and as a freelance Graphic and Commission Portrait Artist before entering the world of Public Education, While teaching high school traditional and digital Art, Harkins earned an MAT in Creative Arts from Bridgewater State University. 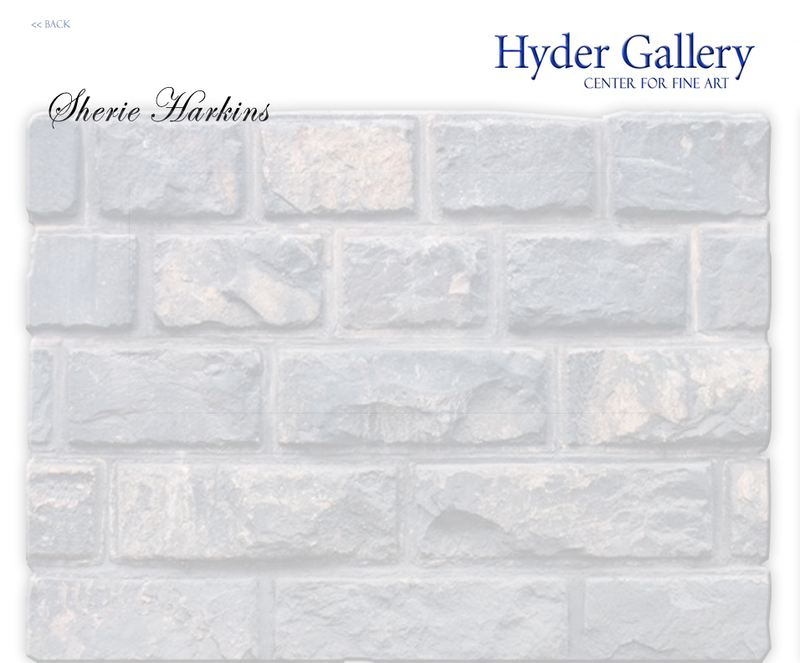 Harkins resides in Providence Rhode Island, a creative hub of arts resources and educational opportunities, where she where she has become a prolific and sought after fine art painter. She continues to teach, and to expand her own studies through the Rhode Island School of Design. Her work is part of numerous collections and exhibitions across the country. Harkins’ work beautifully reflects an exceptional skill with formal elements; composition, transparency, texture, color and form, but the authenticity of their emotional impact comes through as she paints these themes in tangible form. These are images of people, time, and relationships in all their fragile vulnerability; different, shifting, hard and soft, the overlap and setting always affecting the way we view others and ourselves. “Each drop of water or color variation is magnified. Every shadow and subtle surface change takes on a new meaning when viewed in the outsized context.” - Paula Martiesian, BankRI Galleries Curator. "Collectors are often drawn to Harkins’ technique first, and then the emotional impact of what the painting evokes connects in a unique and powerful way." - Andrew Hyder, curator of Hyder Gallery Center for Fine Art. 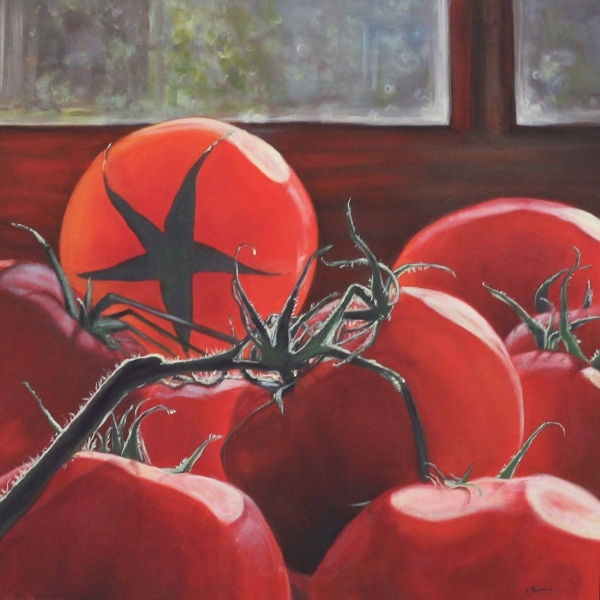 Sunlit tomatoes resting on a windowsill waiting to be enjoyed. Shades of red, green, brown and gray. Signed, limited edition reproductions of this original painting are available as well. Height 36" x Width 36" x Depth 1.5"
Catching sight of this splendid fruit with the warm summer light shining through it I was mesmerized by the visual feast.